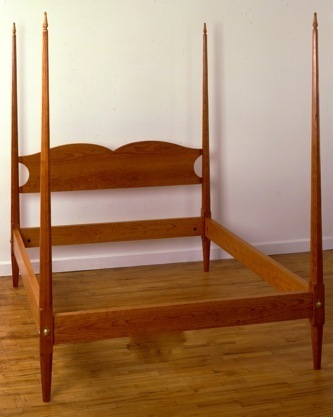 This Pencil Post bed is one of the most elegant and simple designs from the New England tradition. Available in cherry, walnut, curly and bird’s-eye maple. Also available in platform (no box springs) or regular (with box springs and held by bed brackets on the rails). Full, Queen or King sizes. Send request for various headboard profiles available.